We have just released a new collection of turquoise stones which we are pretty excited about. 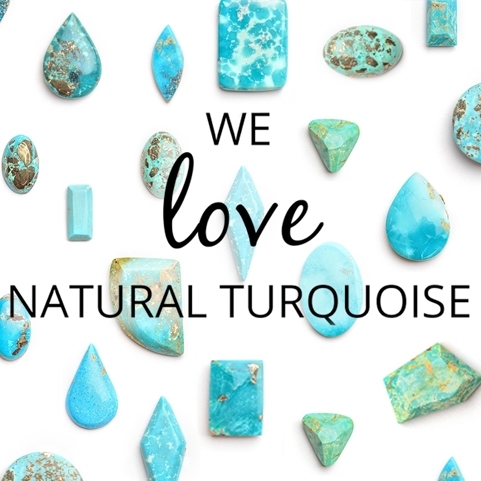 Totally natural and untreated turquoise is now very rare and constitutes less than 3% of the turquoise for sale across the world so when we sourced this new collection of natural Persian Turquoise we were very excited. Persian Turquoise is typified by its prized bright robin egg blue colour. Some of the material is clear, bright turquoise blue and some features wonderful pyrite markings and others mottled white and turquoise reminiscent of the markings in Larimar. Most of the turquoise that is available for sale now is treated in some way, either stabilised to make it stronger and more suitable for cutting and use in jewellery and often it is also dyed as well. We now have two sources of totally natural turquoise, both the Persian turquoise and from Colorado, USA. Both these sources produce very high quality, hard, strong material with excellent colour. Our beautiful 100% natural Persian turquoise cabochons have not been treated in any way. We have been lucky to be able to source this turquoise directly from the owners of a turquoise mine in Kerman, Iran, where it is also cut and polished by Iranian locals. Turquoise has been mined in Iran for over 5000 years and it is this turquoise that sets the quality standard for all turquoise.